Govt to Declare Emergency After PM Resigns? Protestd in Addis Ababa (file photo). Though in the midst of crisis, Ethiopia is enjoying a moment of triumph and optimism. The protest movement that has forced Hailemariam's resignation, though marked by occasional violence and the destruction of property, have been remarkably peaceful constrained, given the many hundreds of thousands who have marched and the brutality of the Ethiopian army's attempts to quell them. They have also succeeded beyond anyone's expectation: not since the end of the apartheid period in South Africa has any autocratic regime voluntarily agreed to release thousands of political opponents and to open civic space. But will it last? If Hailemariam's departure is intended to make way for the appointment of an Oromo leader to the prime minister post, then the move will go a long way to diminishing tensions in Ethiopia. 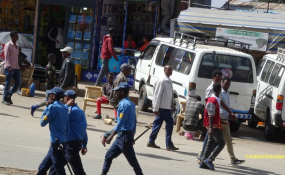 The protests have been driven by the perception that the Oromo, a population of some 40 million people and the largest ethnicity in Ethiopia, are systemically excluded from political and economic power. In response to the prisoner releases on February 13 and 14, an organized regional strike that sent tens of thousands of people onto the streets earlier this week has been suspended. That suspension represents a positive reciprocation by the Oromo opposition, and is a hopeful sign that negotiation can succeed, if tensions can be kept in check. But protests and violence are continuing in pockets of Ethiopia. If the ruling party chooses to replace Hailemariam, as feared, with a hardliner representative of the Tigrean elite, or - worse - if it reinstitutes martial law by calling another state of emergency, the situation could easily explode. Bronwyn Bruton is deputy director and director of programs and studies in the Atlantic Council's Africa Center. Follow her on Twitter @BronwynBruton.